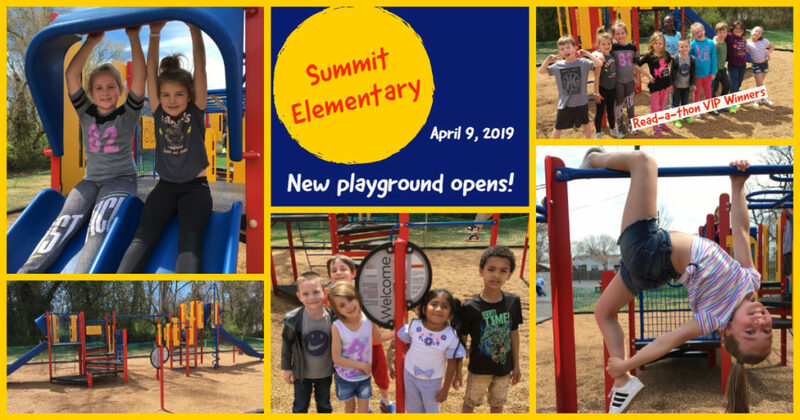 On Tuesday, April 9, 2019, Summit Elementary opened its new playground for use. Ten students each raised $100 or more for the school’s Playground Read-a-thon, earning a pizza lunch with Principal Dr. Julie Haake and the privilege of being the first students to use the playground. In the afternoon, all classes got to enjoy the new playground and the sunny spring weather. Summit Principal Dr. Julie Haake thanked her predecessor as principal, Mr. David Stroot, along with CUSD 10 Superintendent Dr. Robert Green and Buildings & Grounds Director Mike Hollingshead for moving the playground project from dream to completion. Click HERE to watch a highlight video of the playground’s first visitors.